Another sample of 2 colour logo on front. 6 Foot with front imprint only: $225.00 plus $50 setup - 6 Foot with 4 sided imprint: $245.00 plus $50 setup - 8 Foot with front imprint only: $250.00 plus $50 setup - 8 Foot with 4 sided imprint: $270.00 plus $50 setup - Volume pricing available starting at 5 pieces. - Call or email us for a quote. 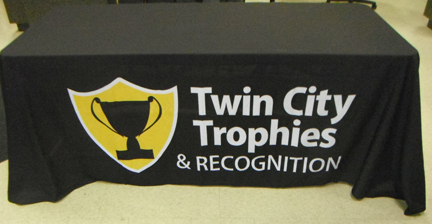 Sublimated 6 Foot (non-fitted) trade show table cloth. Made of 100% Polyester - This sample shows 2 colour logo on Front. Dye sublimation puts the colour right into the fibres of the material. It can be washed in regular washing machine. Will last for many years and will never crack or fade. 8 foot size also available.